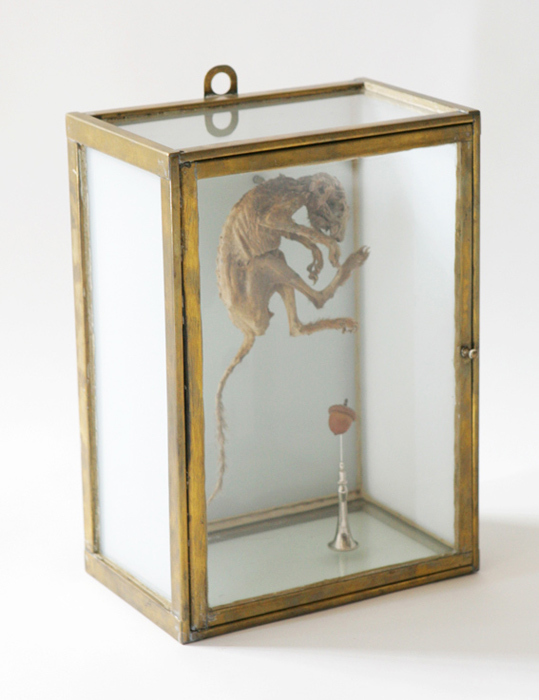 The work comprises a naturally mummified squirrel in a glass case – actually an old medical cabinet built in about 1930 and sourced from a chemist's shop. 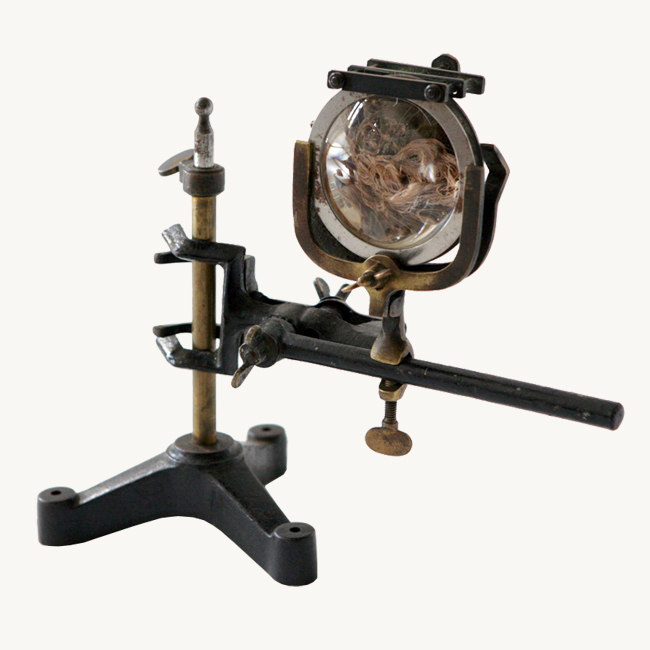 The case consists of a soft-soldered brass frame with glass doors. 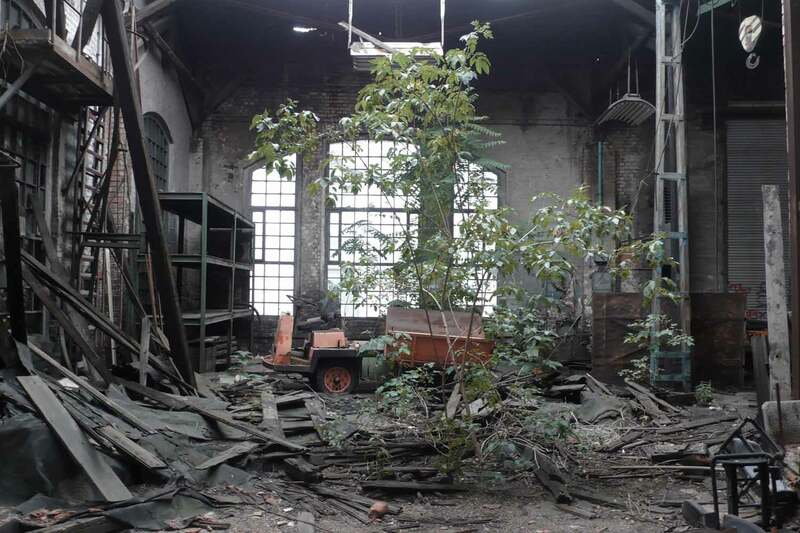 However, the panes of glass at the sides and the rear panel made out of white cased glass have been added since to give the impression of a sterile hospital atmosphere. 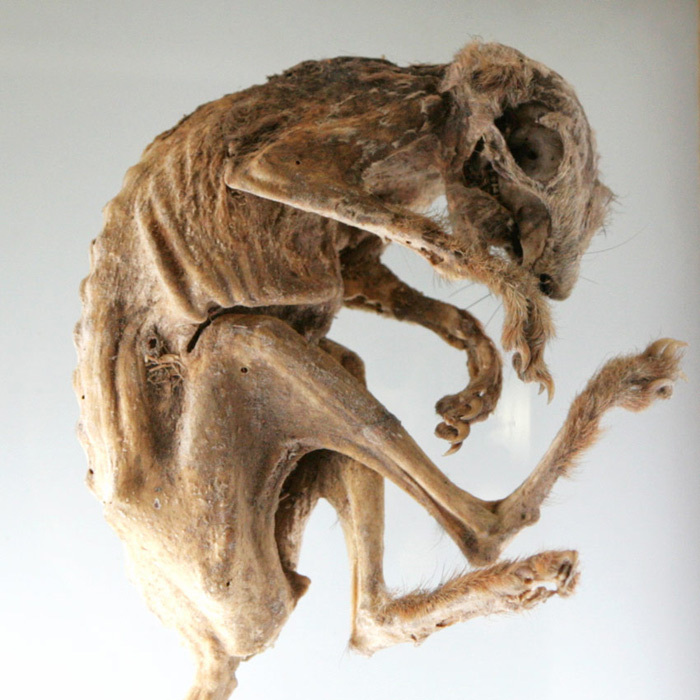 The expressive, very well preserved squirrel mummy in a natural, lifelike pose with the remains of its red fur is fixed to the cased glass rear wall by two cannulae. 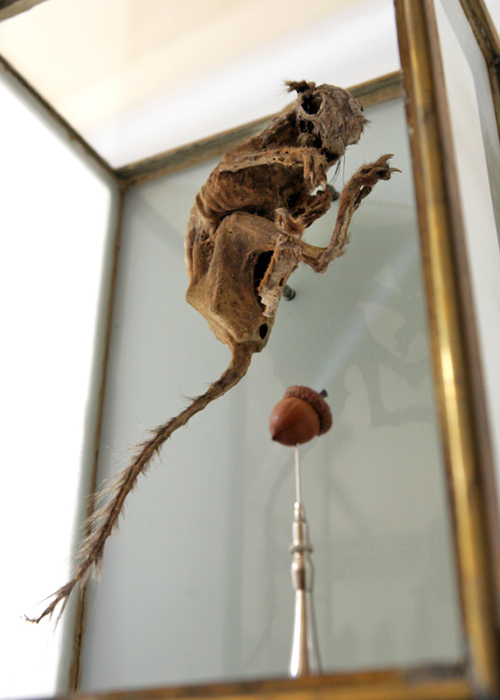 The squirrel is displayed on a stand consisting of an ear speculum and a cannula positioned loosely in the glass case. 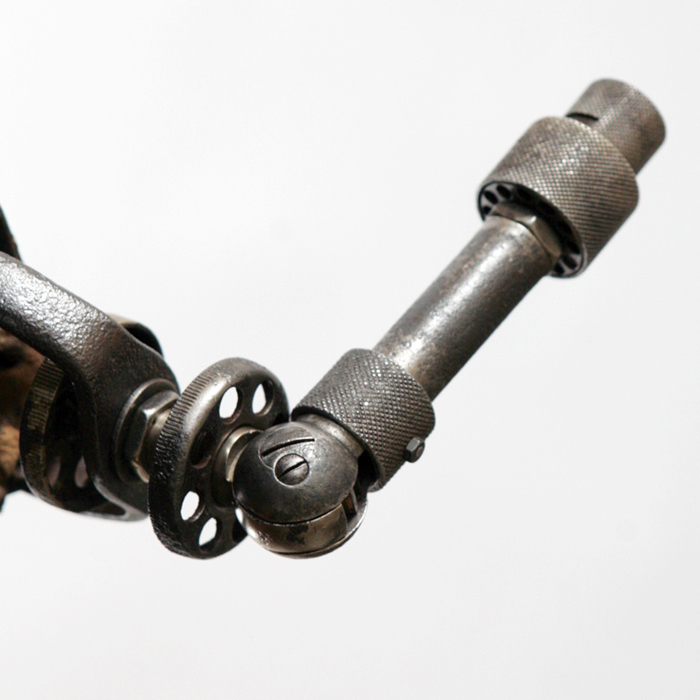 This artificial right arm was made in about 1920. 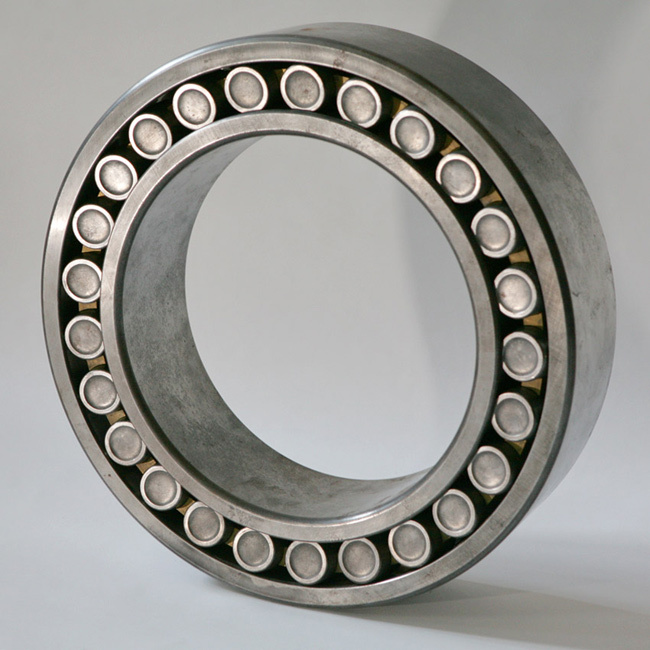 The sophisticated mechanism can be moved in all natural positions. 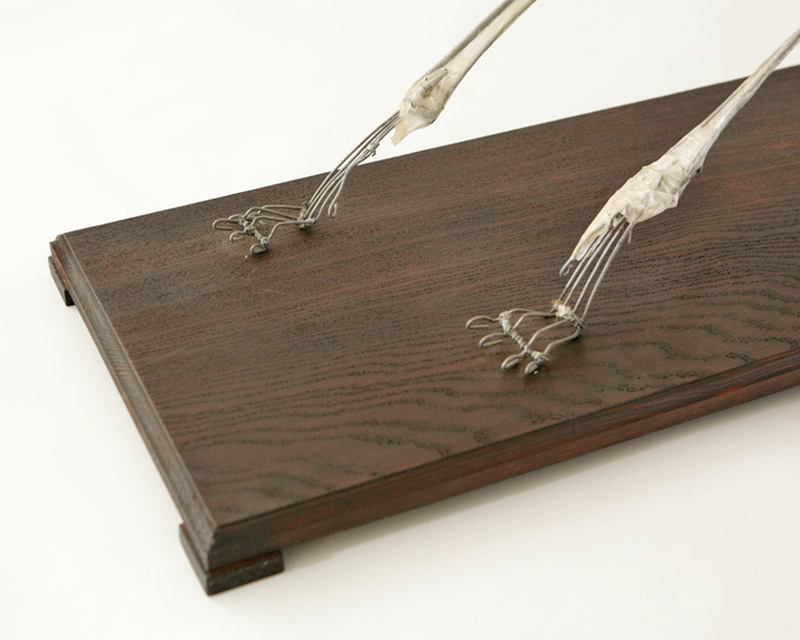 The pivoted claw is removable, and can be opened and closed using a cog mechanism. 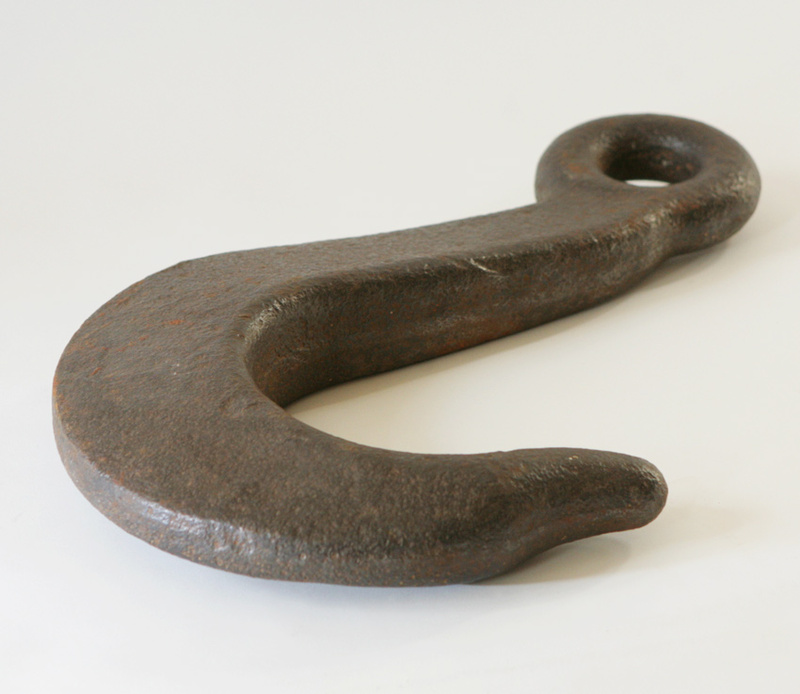 Note that the arm shows signs of considerable wear: the iron is scarred by rust while the leather is stiff but not brittle. 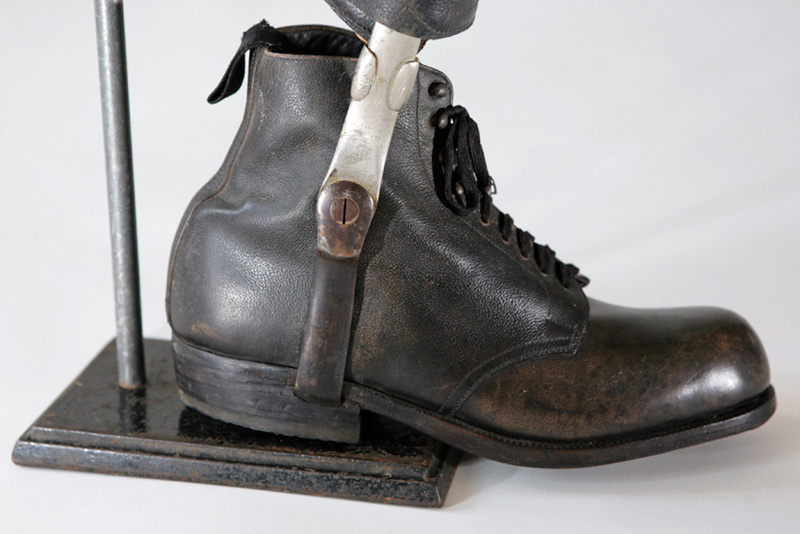 This especially exquisite example of an artificial limb features a stunning patina. 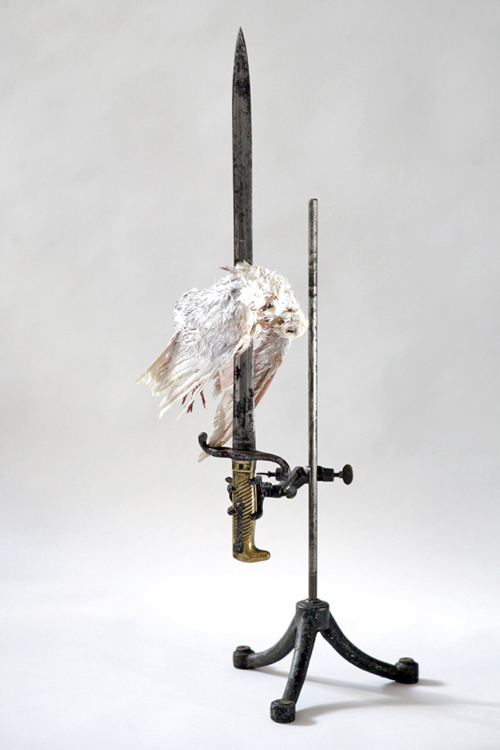 This sculpture inspired by John Heartfield's 1932 photomontage 'The Spirit of Geneva' consists of a pigeon impaled on a German bayonet made in 1871 by the Weyerberg Brothers in Solingen, a German town famous for the production of knives and other blades. 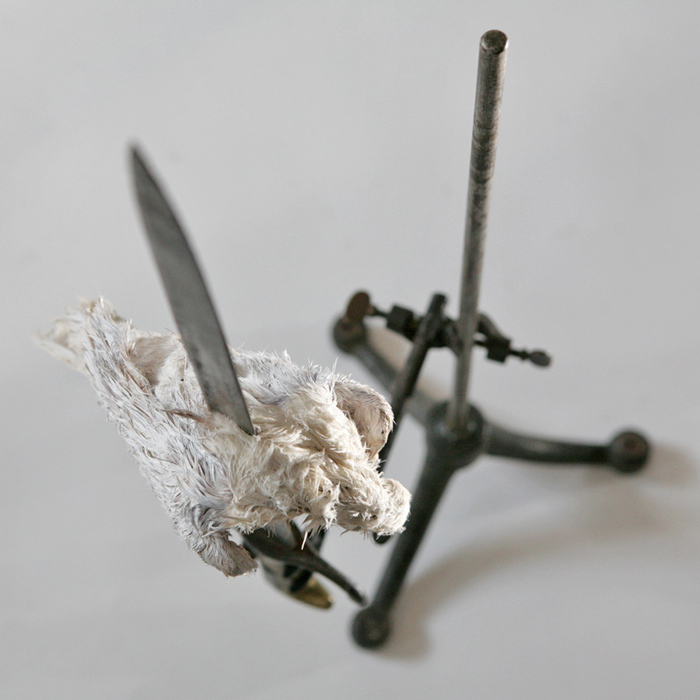 The pigeon is a dried, stained formaldehyde specimen dating from around 1920. 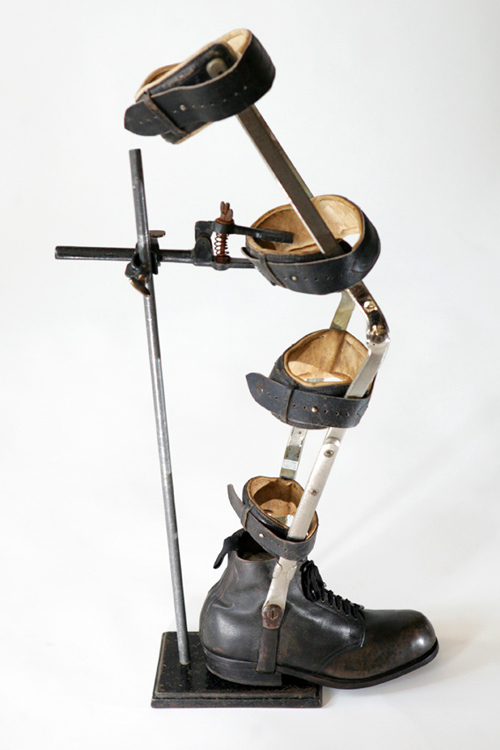 The sculpture is mounted on a laboratory stand produced in about 1900. 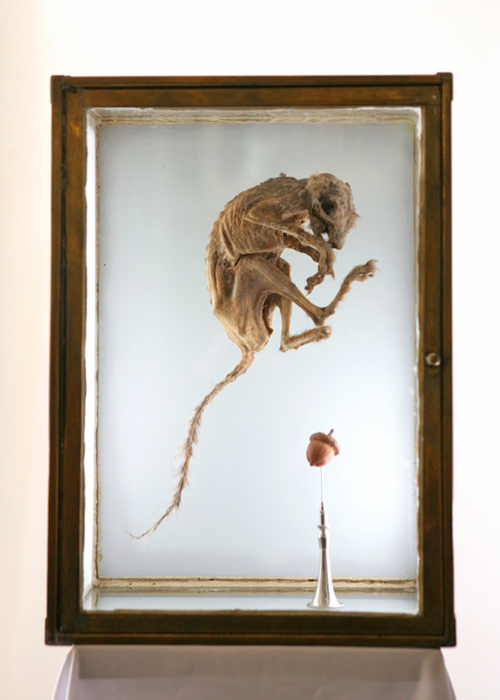 Preserved chicken embryo from an old school specimen used to explain the development of the domestic fowl. 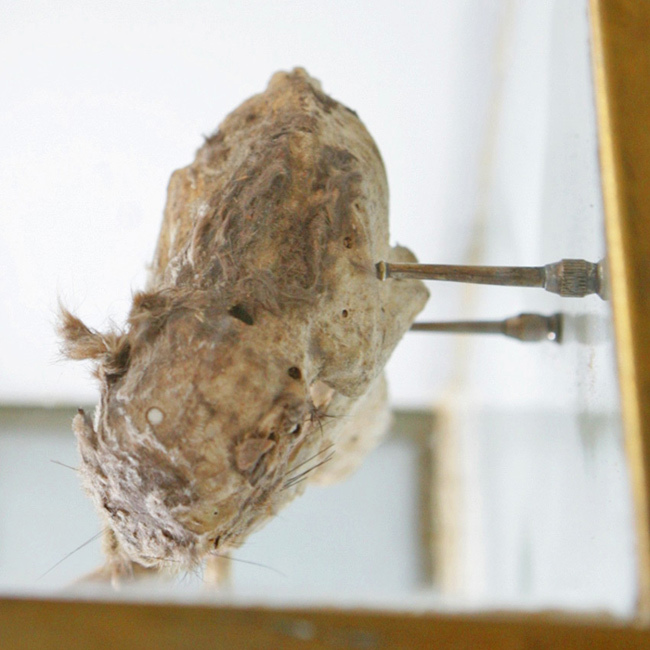 The specimen has been dried and positioned between a concave mirror and a magnifying glass held in place by a brass and steel laboratory stand dating back to about 1870. The boundaries between the embryo and its reflection are blurred by the distortion caused by the concave mirror. 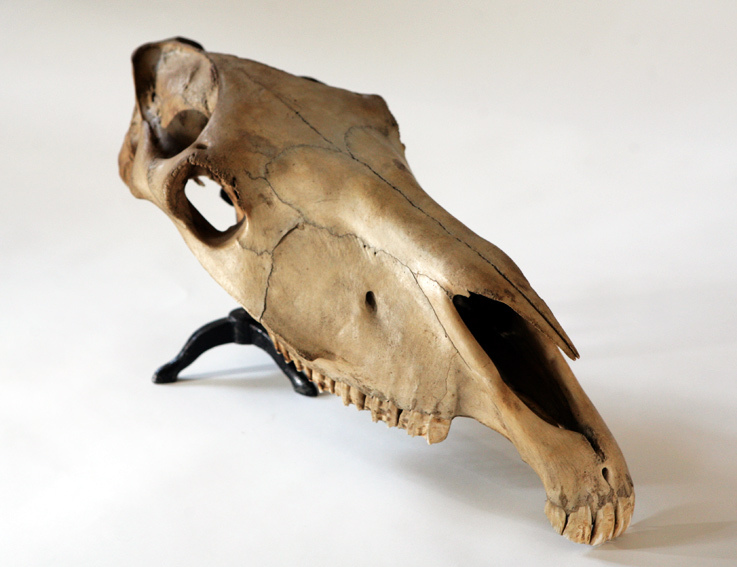 An old horse skull with an unusually beautiful patina. 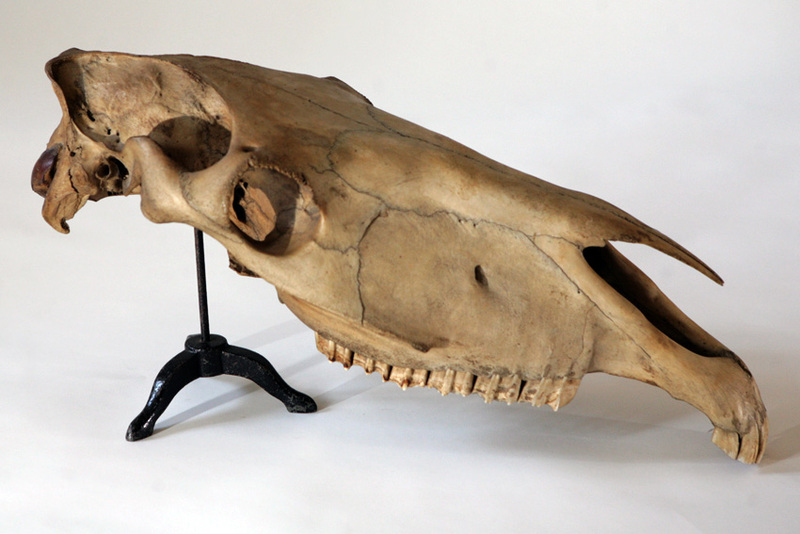 Although its origin and exact age are unknown, I presume that the skull has been suspended for a number of decades or even centuries in a smoky room. 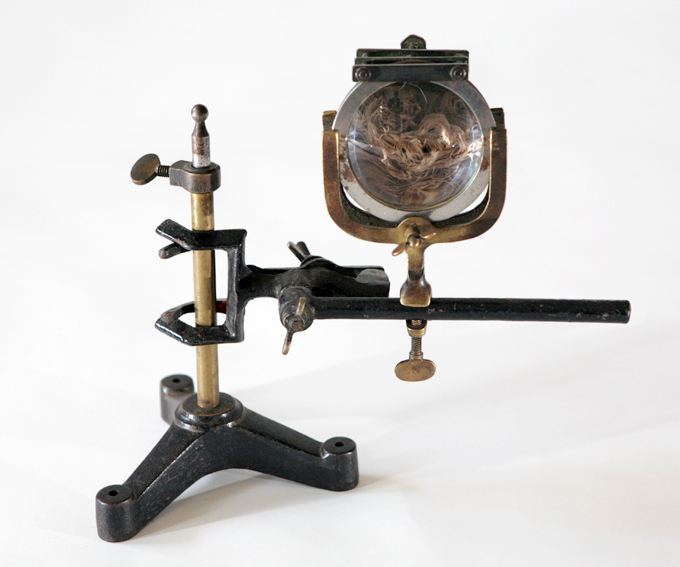 The skull is displayed on an old brass and steel laboratory stand. 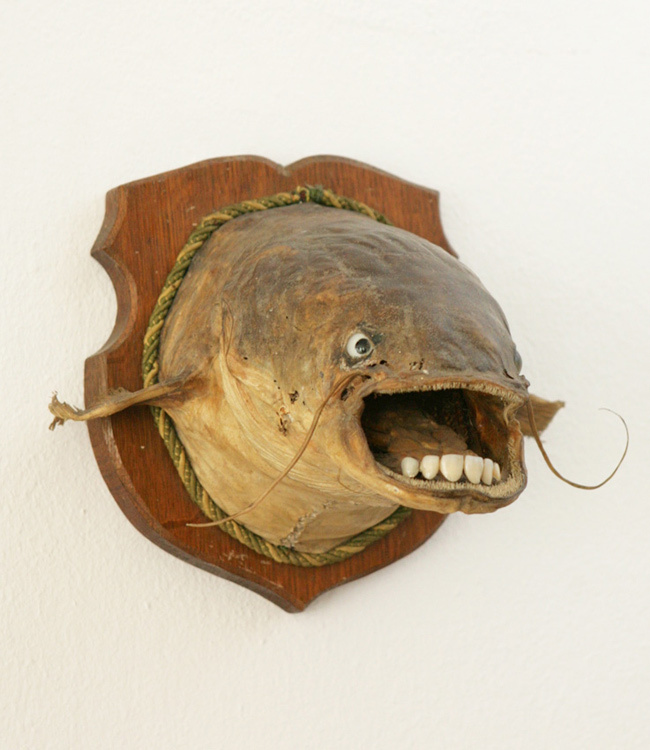 This preserved head of a catfish on a wooden board contains human false teeth made out of metal and porcelain in its open mouth. 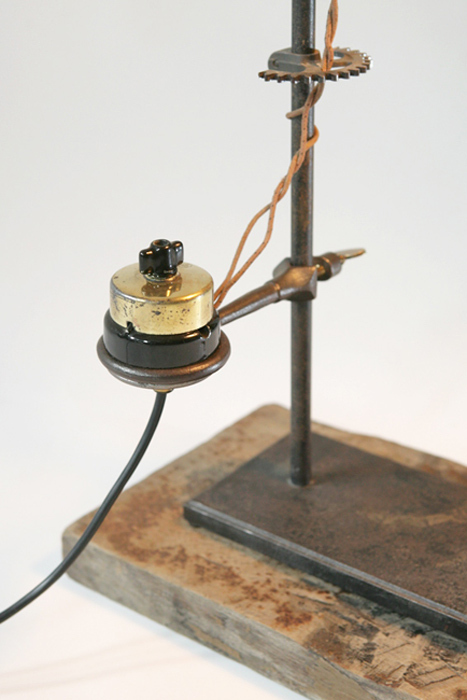 This lamp creation consists of an old chemistry laboratory stand with a beautiful patina mounted on a piece of charming, upcycled wood. 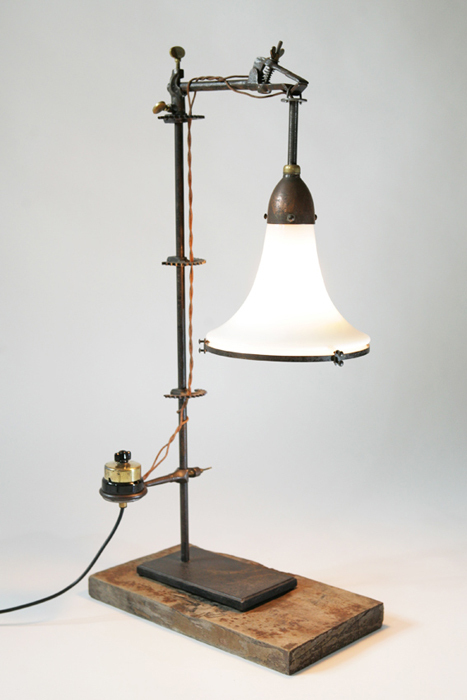 The cable holders are parts taken from an adding machine while the lamp itself is a Siemens model from around 1920 designed by Peter Behrens from Berlin. 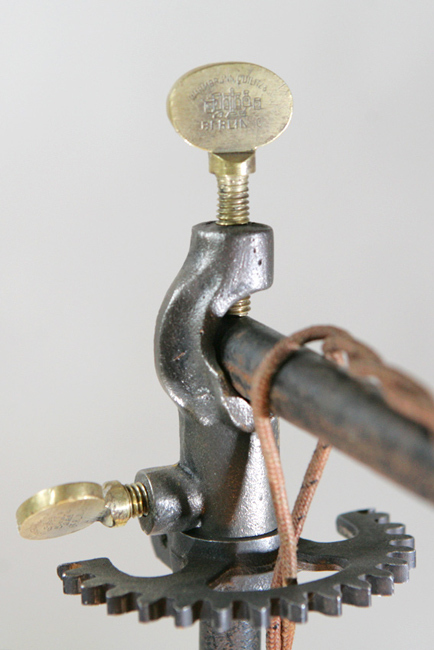 The switch is made out of brass and porcelain. 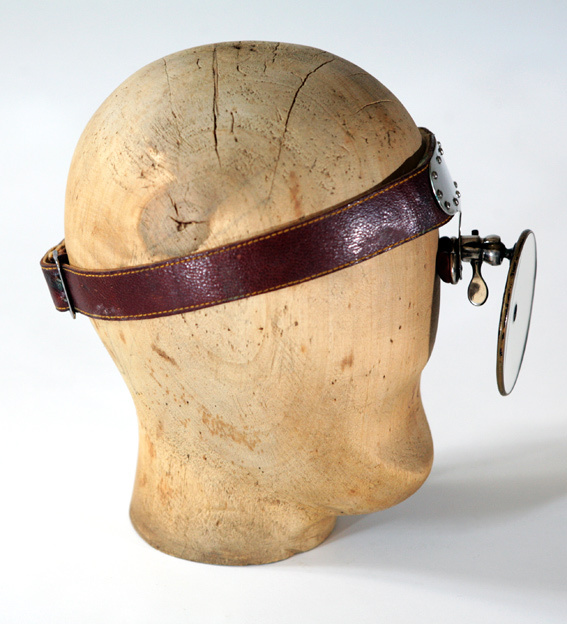 This expressive wig stand was made out of solid wood in around 1880. It even contains the suggestion of facial features to make it more lifelike! 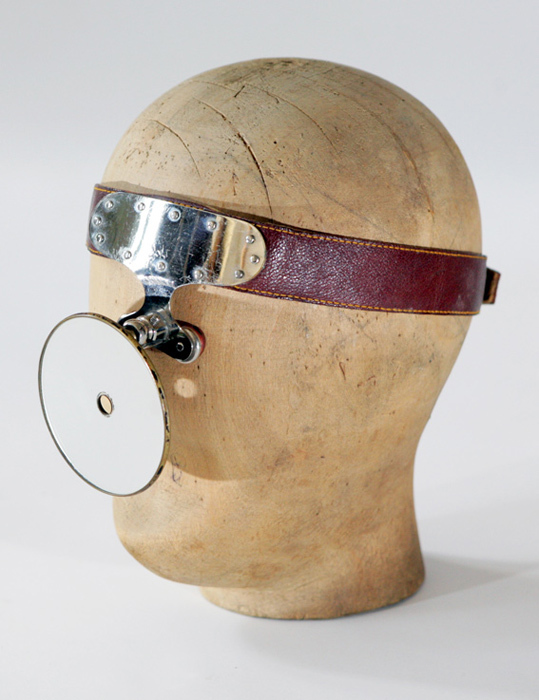 Doctor Wood comes wearing an ophthalmic headband mirror from around 1930 produced in a very elaborate design by the firm Aesculap. 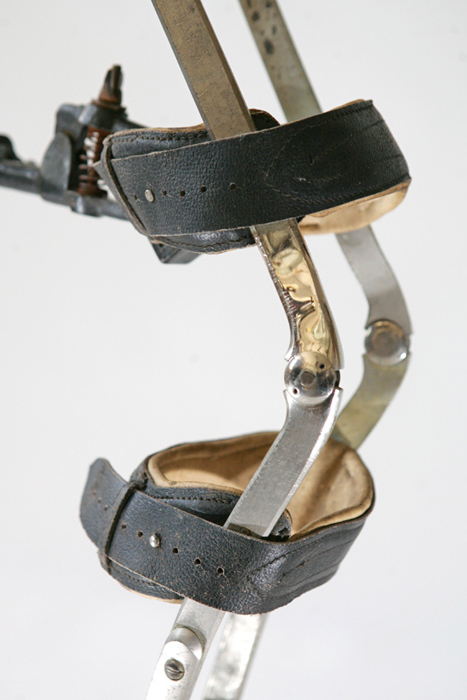 This splint is made out of nickel-plated steel and black leather. 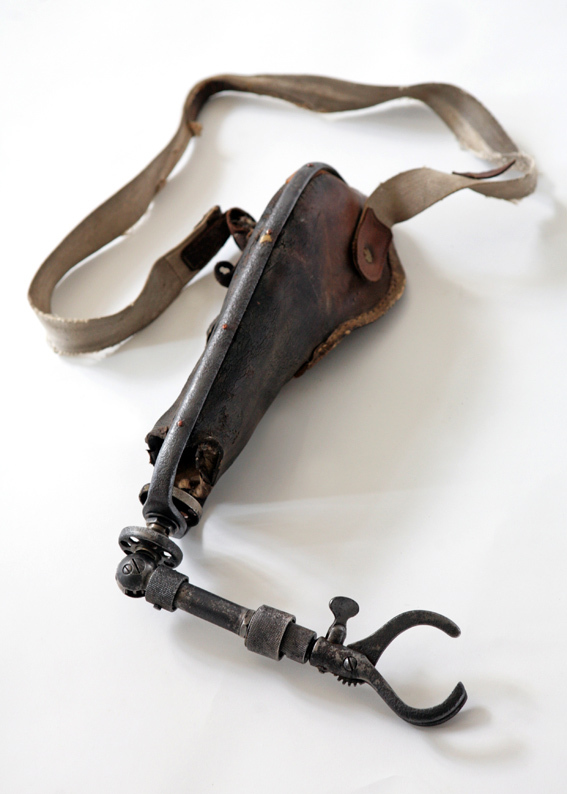 It was used to support an injured leg in connection with a deformity, fracture or joint problems. 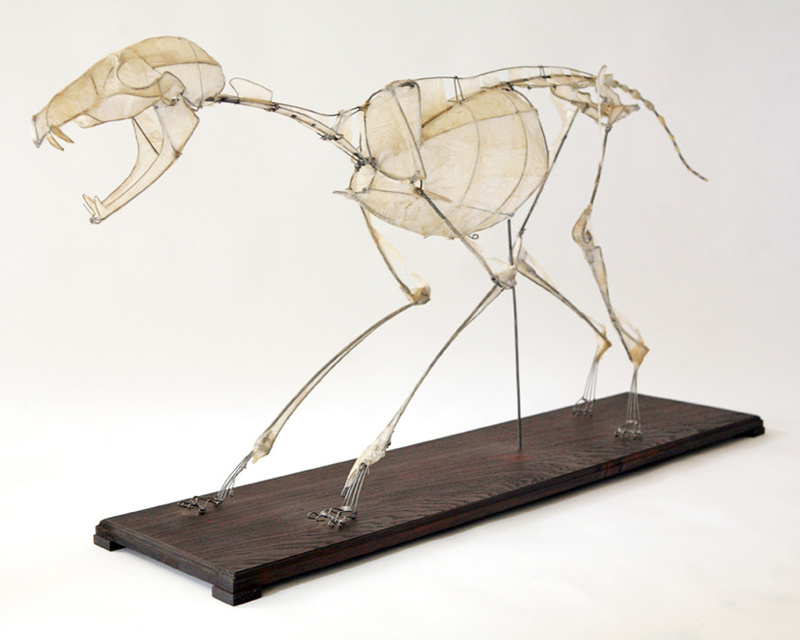 This anatomical model of a running dog is mounted on a solid oak base plate. 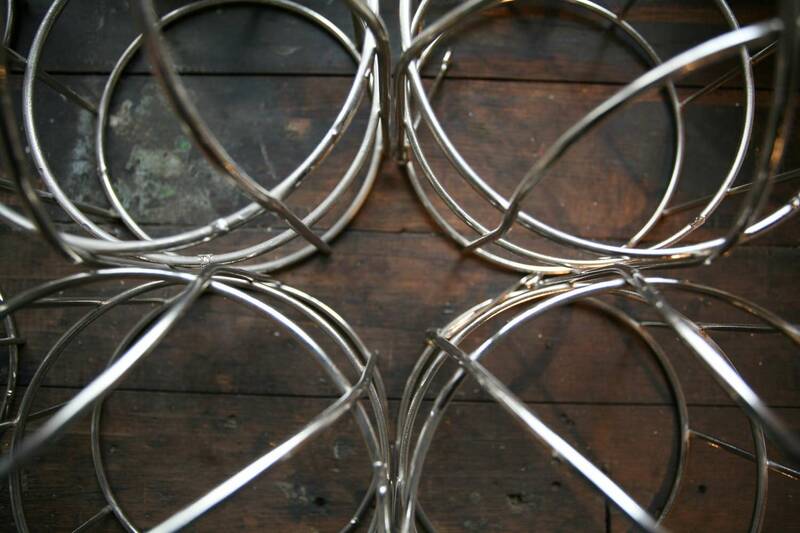 The materials used are greaseproof paper, steel wire and oak. 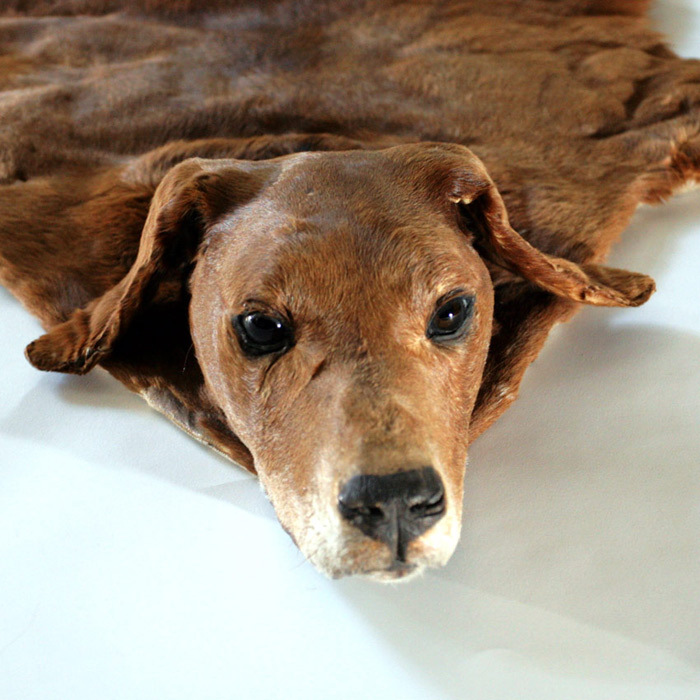 This preserved fur of a large hunting dog features a stuffed head fitted with glass eyes. 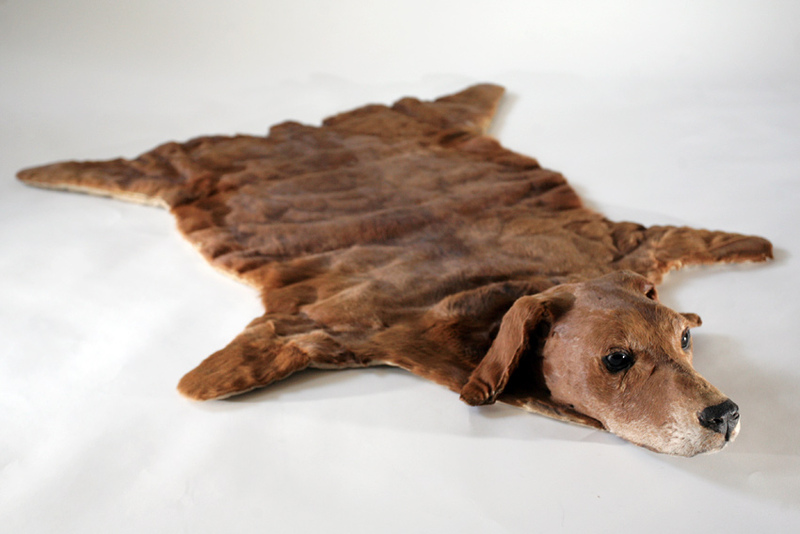 The rest of the body is flat and its underneath has been reinforced with linen, enabling the fur to be used as a bedside rug. 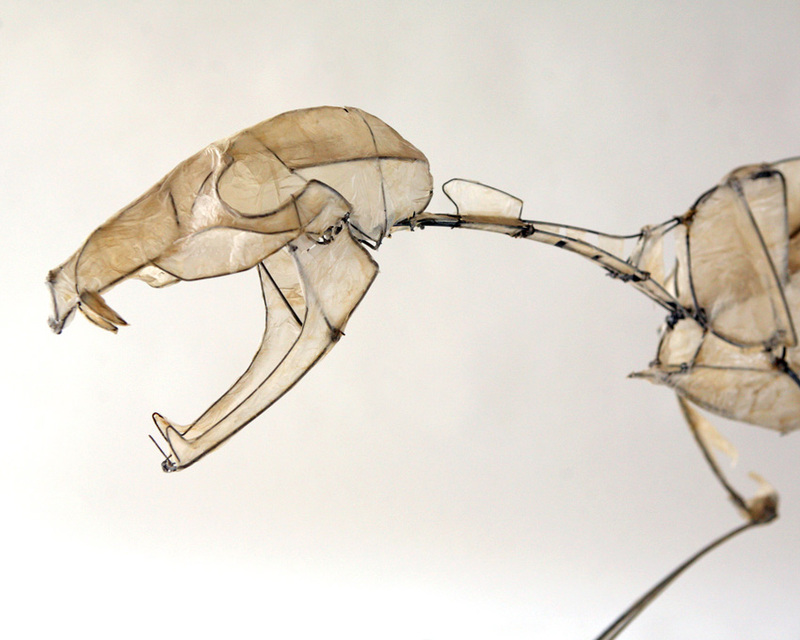 The feet and tail have been shortened. 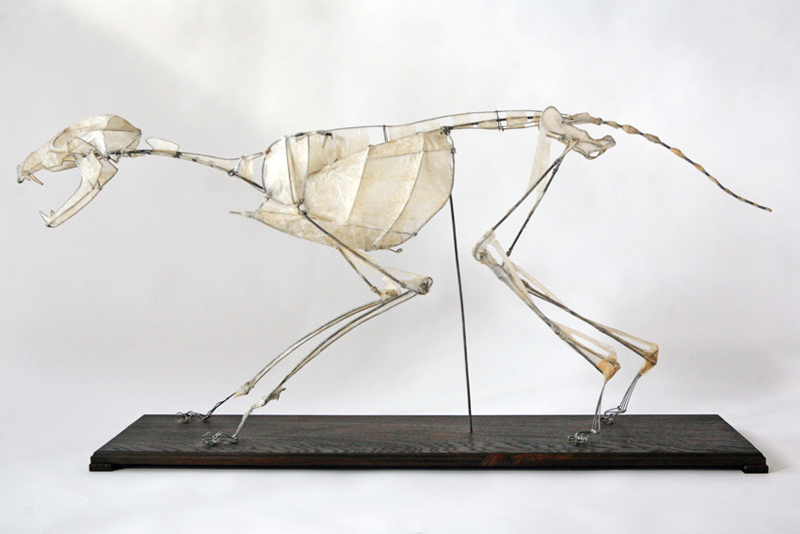 Although nothing is known about the dog or how it died, it probably died naturally of old age and was then preserved on behalf of its master. 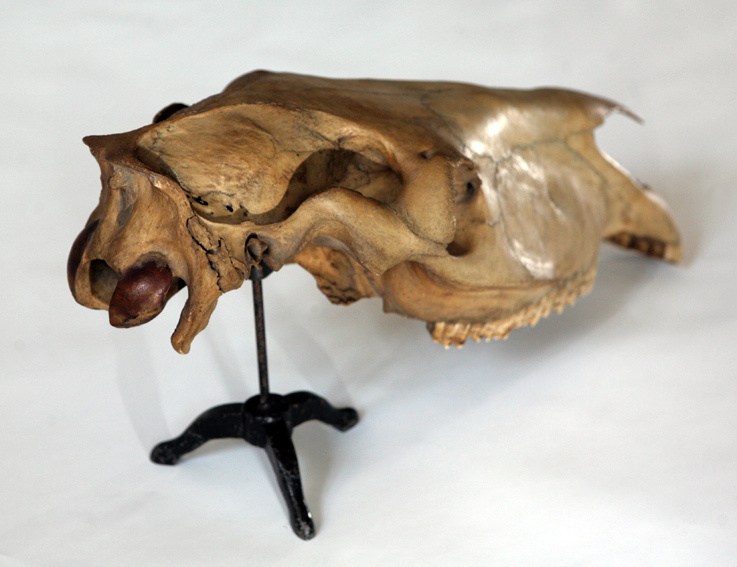 Preserved head of a small, brown dog of an unknown breed mounted on an oak board. 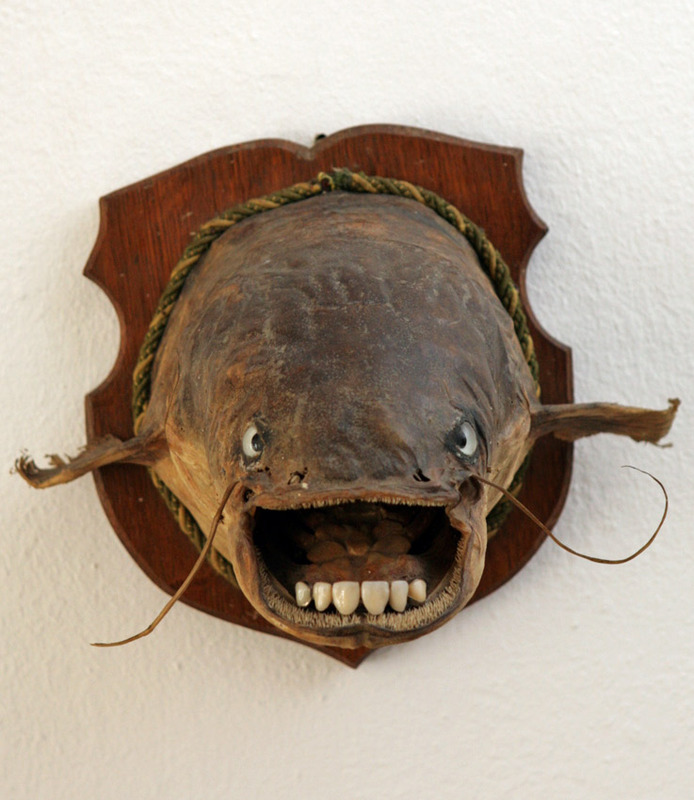 It was preserved about 100 years old and has glass eyes. 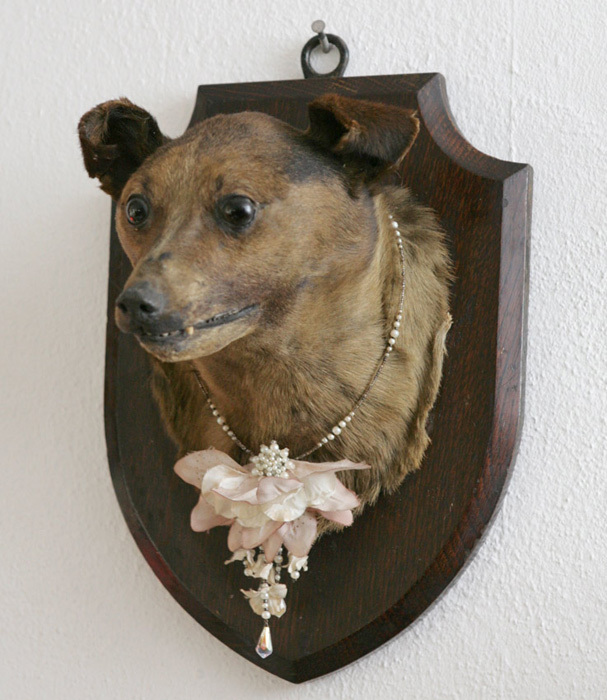 It also wears a flower necklace with pearls from the 1920s. Although the dog's fangs can be seen, it does not look alarming. 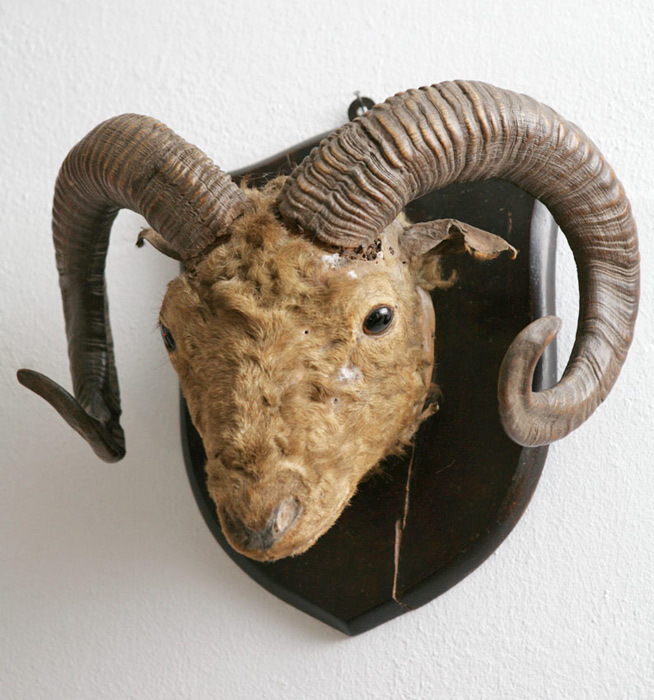 Old preserved ram's head mounted on a wooden board. The head has glass eyes and a mischievous expression. 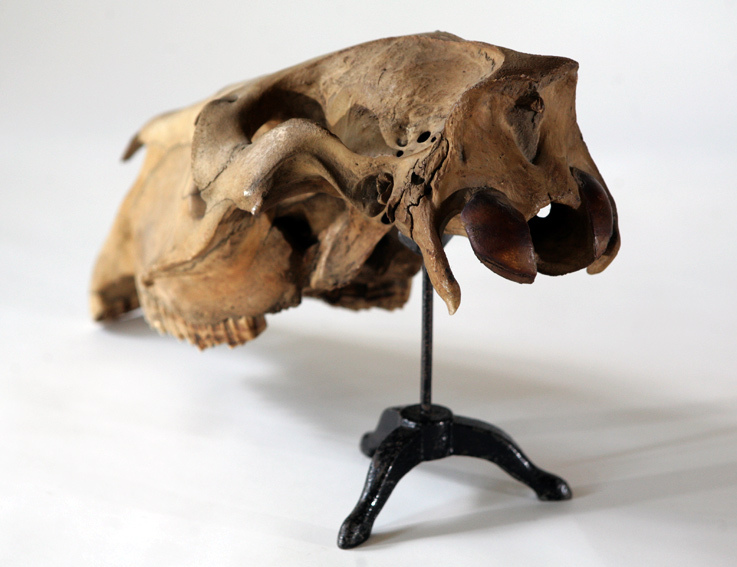 Although parts of the specimen look badly weathered and worn, this only adds to its special charm. Please note that the wooden board is cracked. 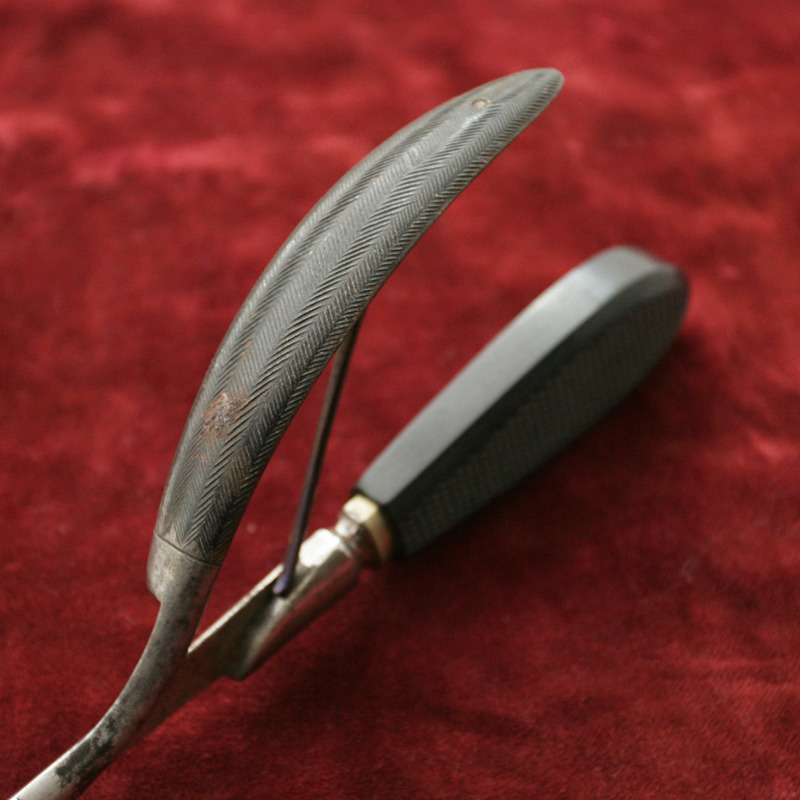 This surgical needle holder made in around 1930 is based on a design by Reverdin. 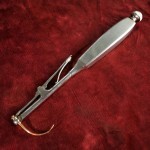 It comes with a replaceable, gold-plated needle. 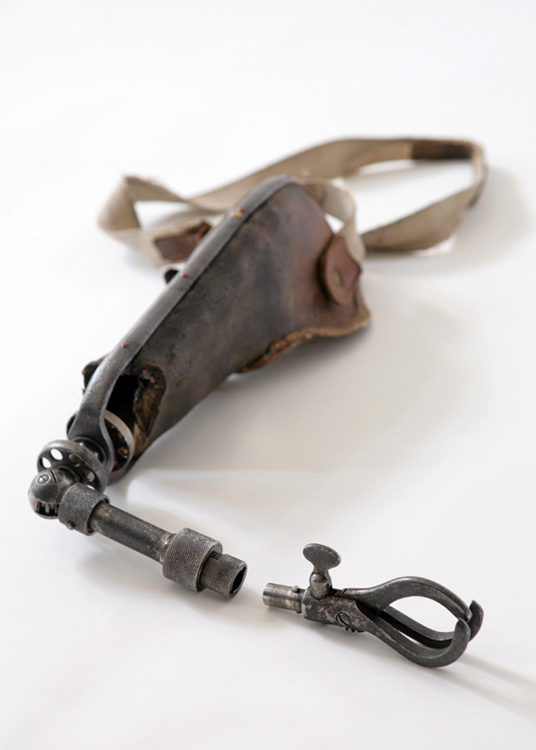 Its lever mechanism used to open and close the eye of the needle in order to be able to grip thread in a wound was a surgical breakthrough in its day. It bears the inscription 'Bruneau Déposé'. 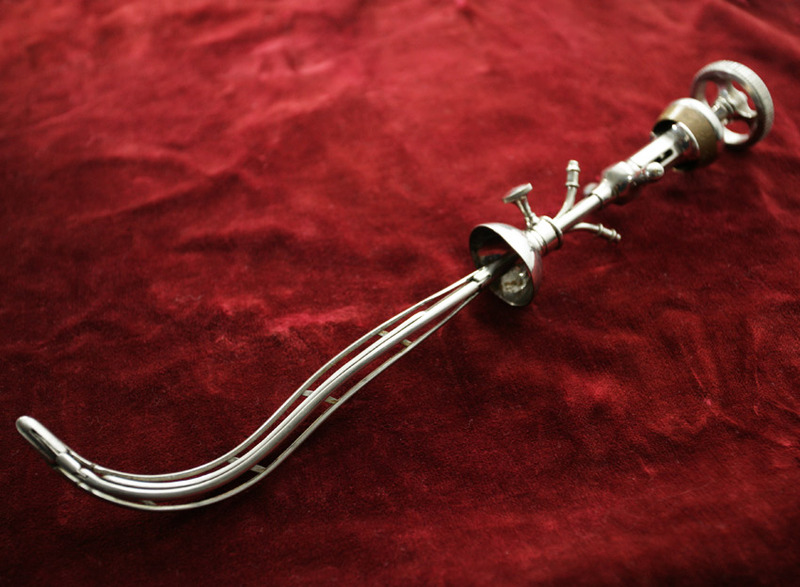 This urethral sound or dilator features four stretchers made in around 1880. 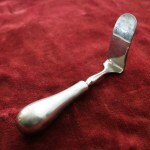 It was used to widen and simultaneously flush the urethra. 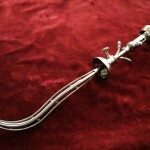 This urethral sound is made out of nickel-plated steel and brass, and bears the marking ‘Ateliers gentile 1243’. 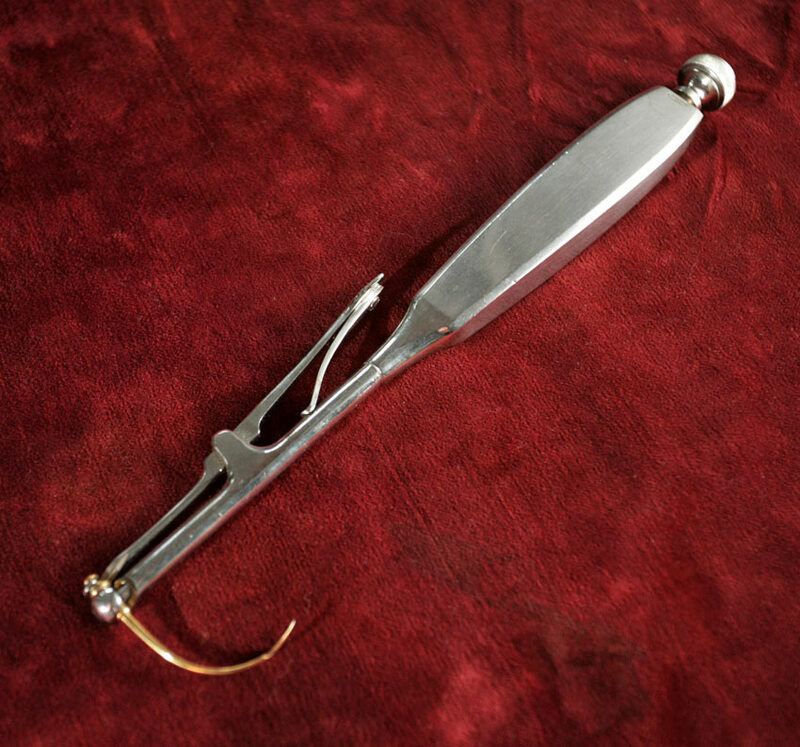 A tongue depresser is a device used by doctors to hold back the patient's tongue while examining the oral cavity. This one is made of nickel-plated brass and was produced in around 1910. 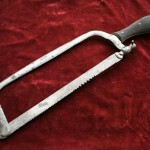 This bone saw used for amputation is based on a Charriere design. 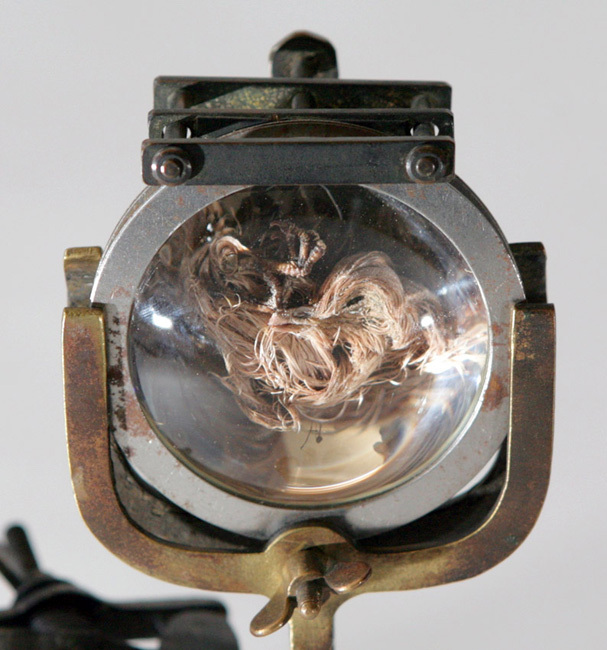 It was produced by an unknown company in Nuremberg (the stamp is illegible) in about 1870. 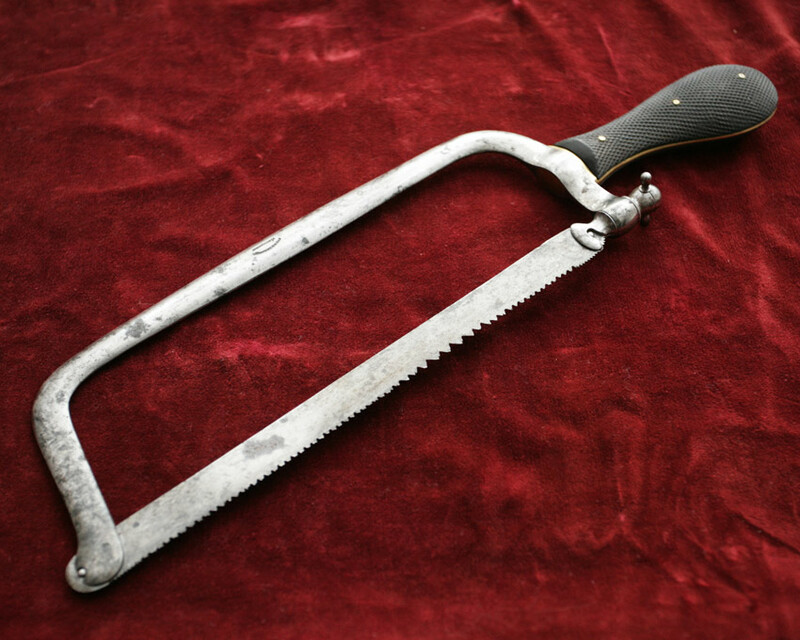 The saw is made out of steel, which is slightly rusty. 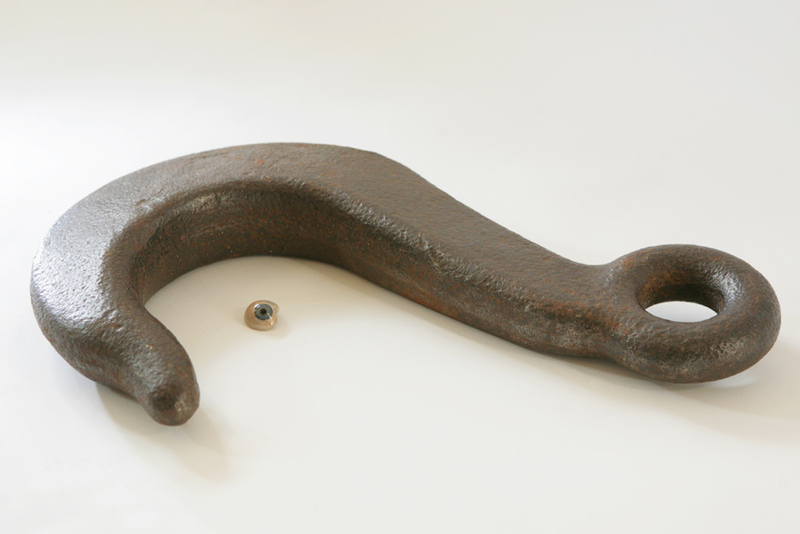 The handle is made of ebony and contains a brass core. 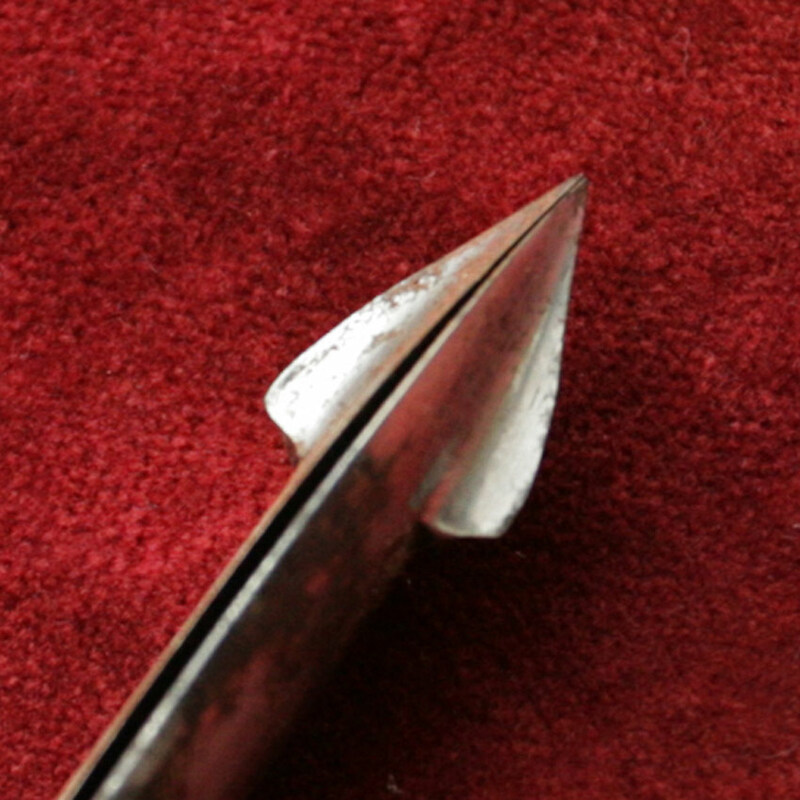 The saw blade has been replaced. 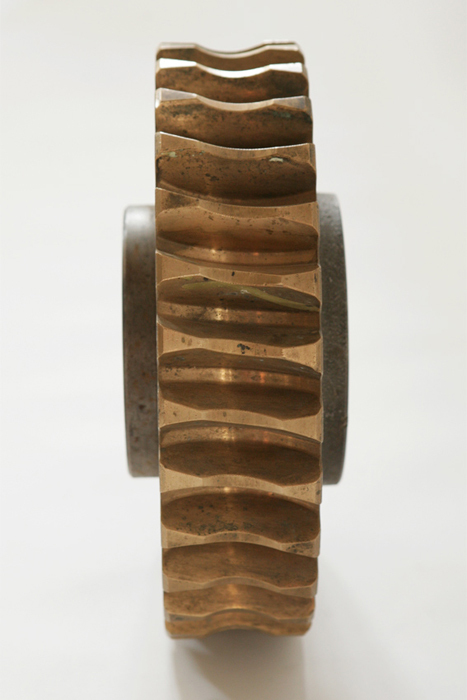 This perforator is based on a design by Blot and was made in about 1870. 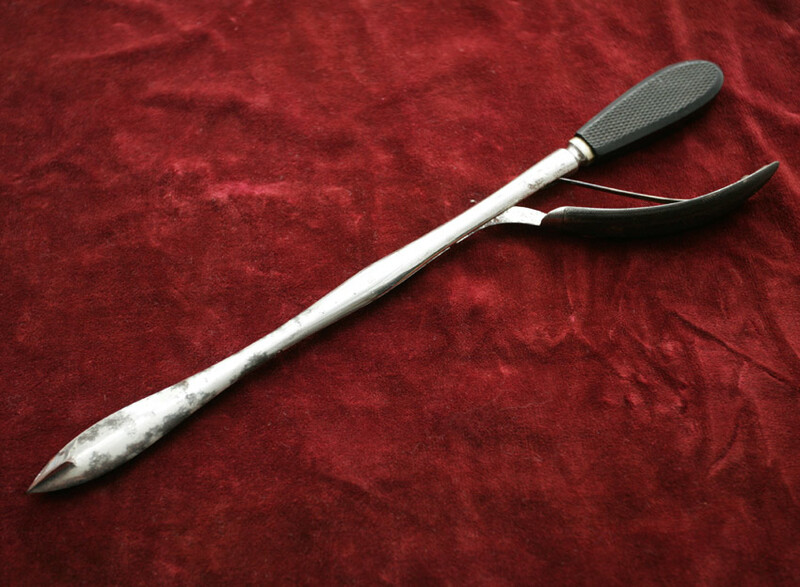 A perforator is an obstetric instrument used to remove a dead baby from the uterus. 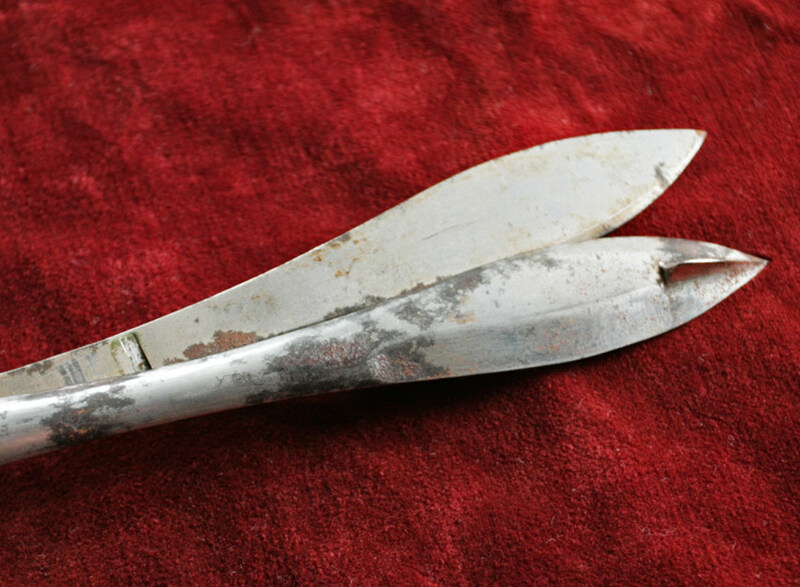 In the late 19th century, it became known in maternity clinics as the ‘sharp dagger’. 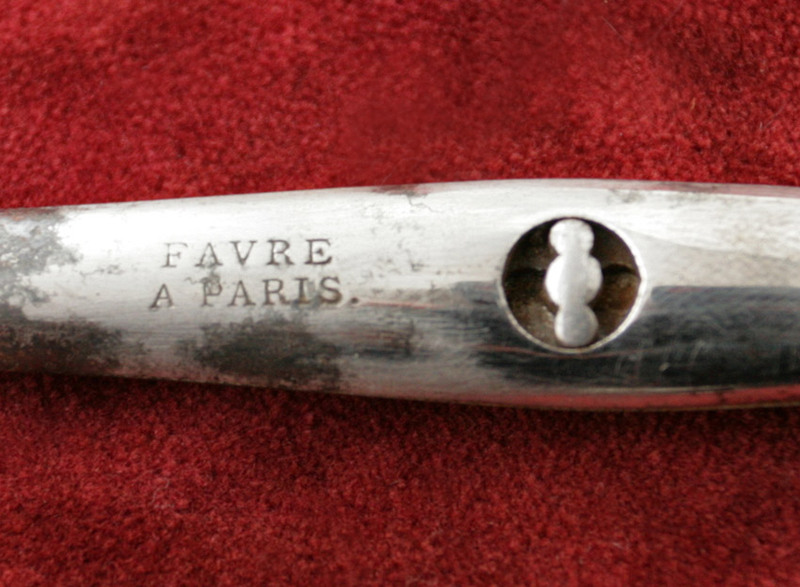 This example is made of steel and ebony and features the marking 'Favre à Paris'. 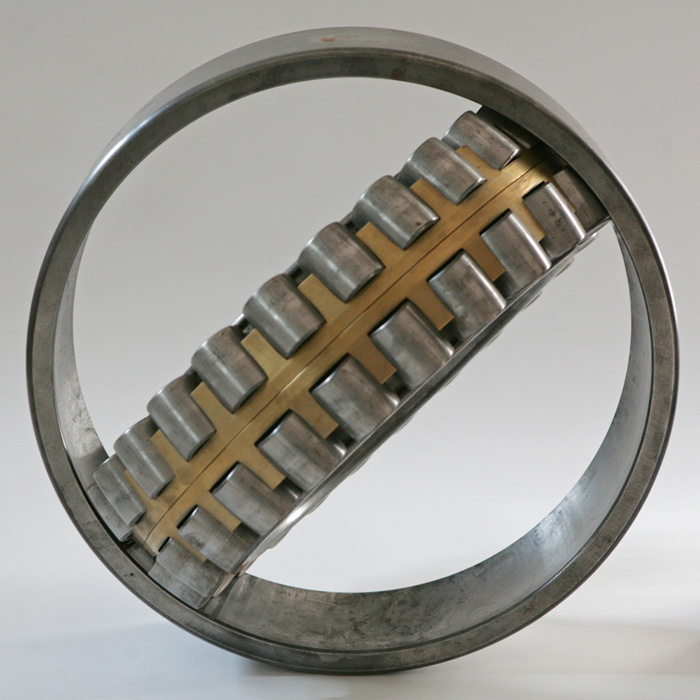 This magnificent roller bearing was originally used in a massive excavator operating in an East German opencast mine. 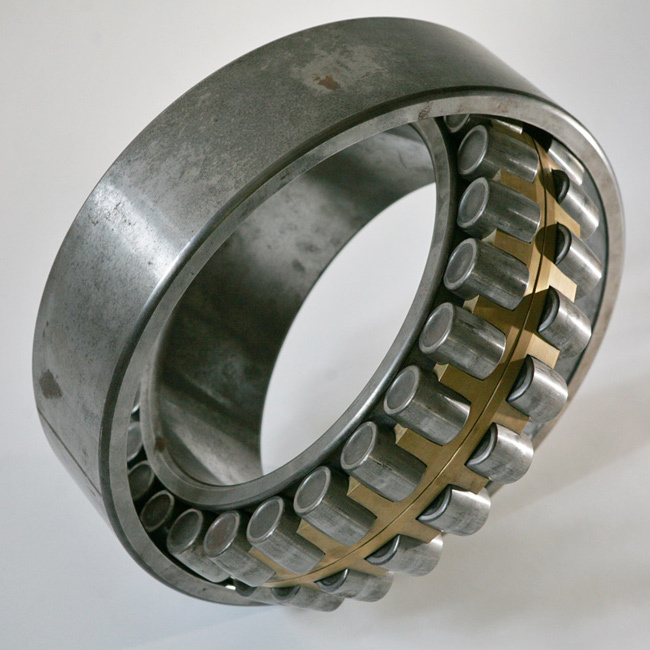 The bearing consists of an outer steel element surrounding a removable inner element holding brass rollers. 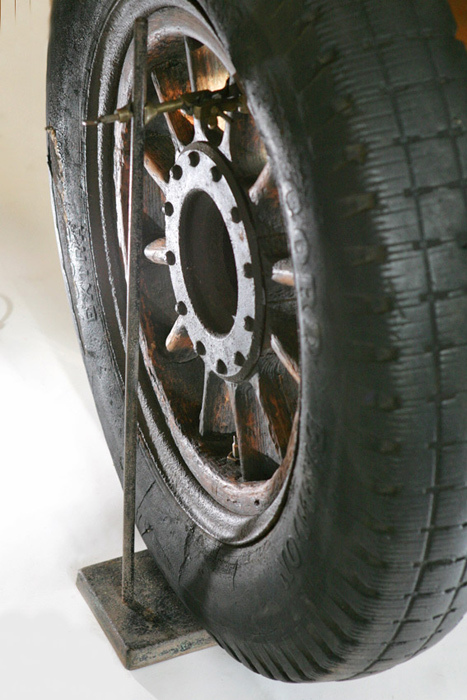 This wheel came from an extremely stylish 1928 Mercedes Nuremberg. 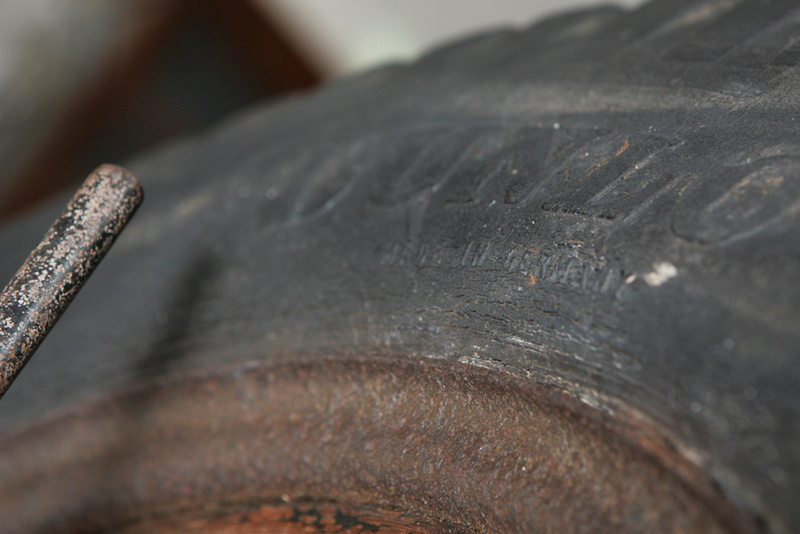 Although the hub and rim are made of steel, amazingly the spokes were actually crafted out of hardwood. 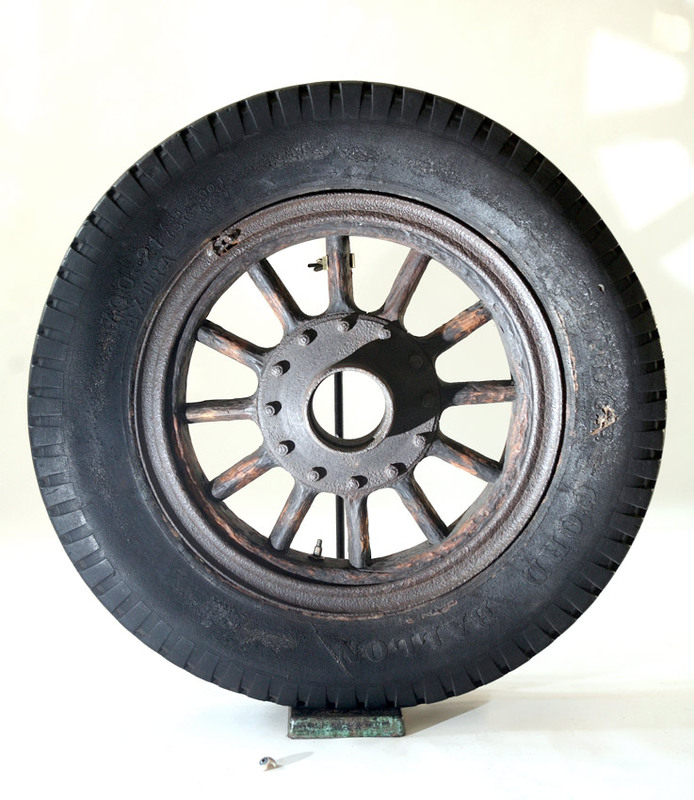 The tyre cover is made of rubber and canvas. 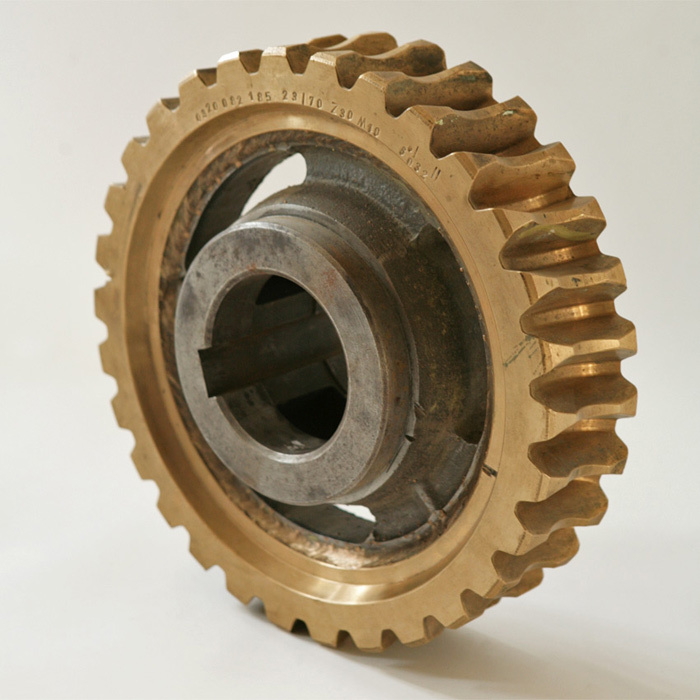 Huge brass cogwheel welded together with a steel core. 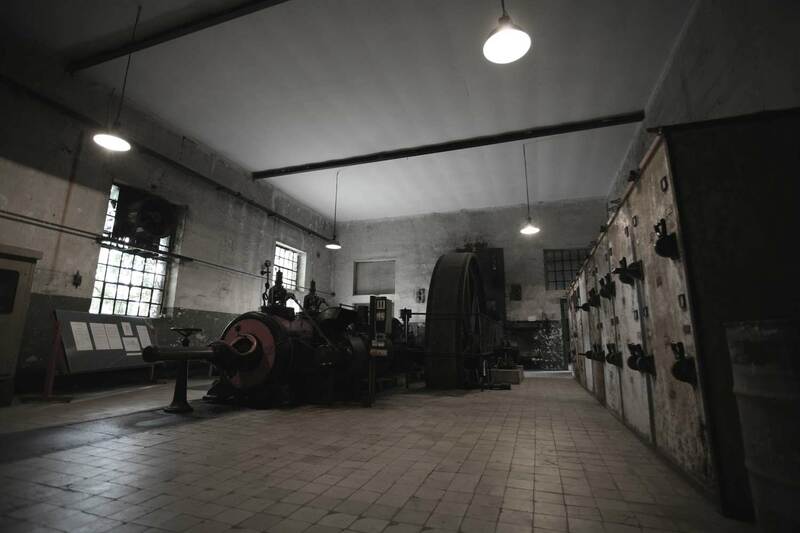 Although the nature of the machine it was once used in has been lost to posterity, even in retirement it's still a very striking item!